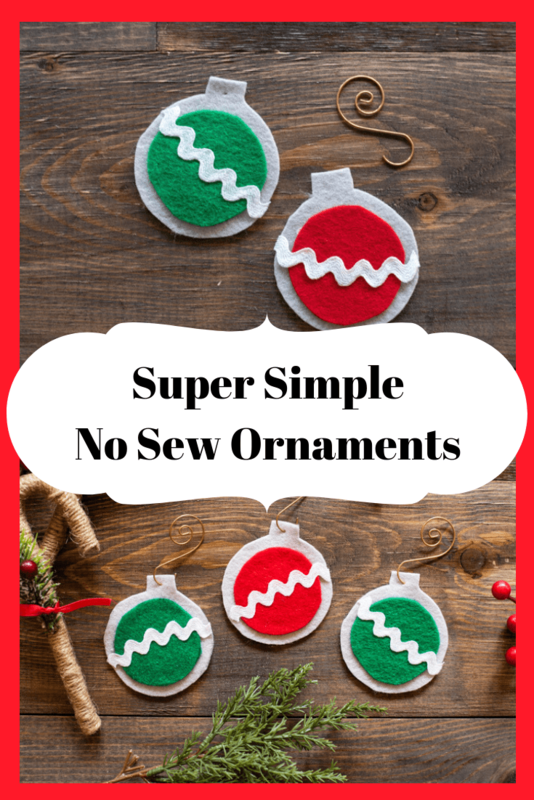 These no sew easy felt Christmas ornaments are so simple to make with a free printable pattern! A couple years ago I created a tutorial for appliquéd Christmas ornaments. I thought the ornaments were quick and easy to make and, in the grand scheme of things, they are. Now that I’m a mom, I’ve realized sometimes you need another whole level of quick and easy when you want to make something! That’s why I created these no sew easy felt Christmas ornaments. 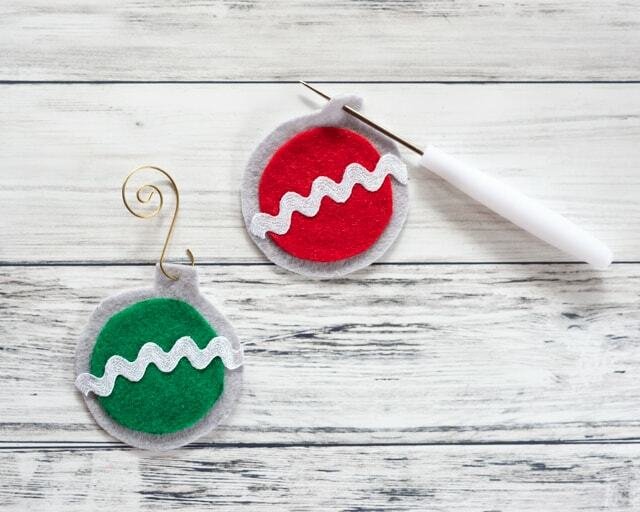 These felt Christmas ornaments are beyond simple to make, plus they’re super cute! 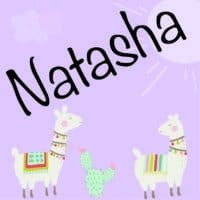 You can customize them quickly and easily with ric rac or other trim and they’re a great no sew felt craft for kids who are working on their cutting skills! 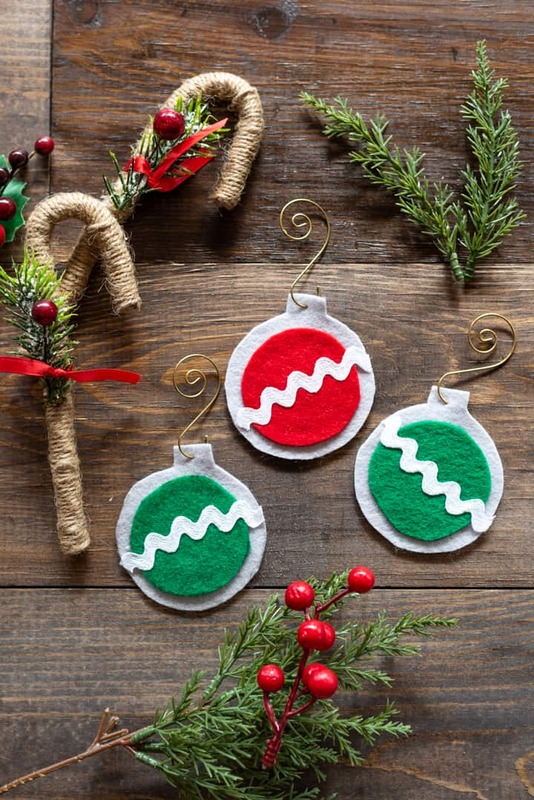 I hope you enjoy making these no sew felt Christmas ornaments are much as we did! 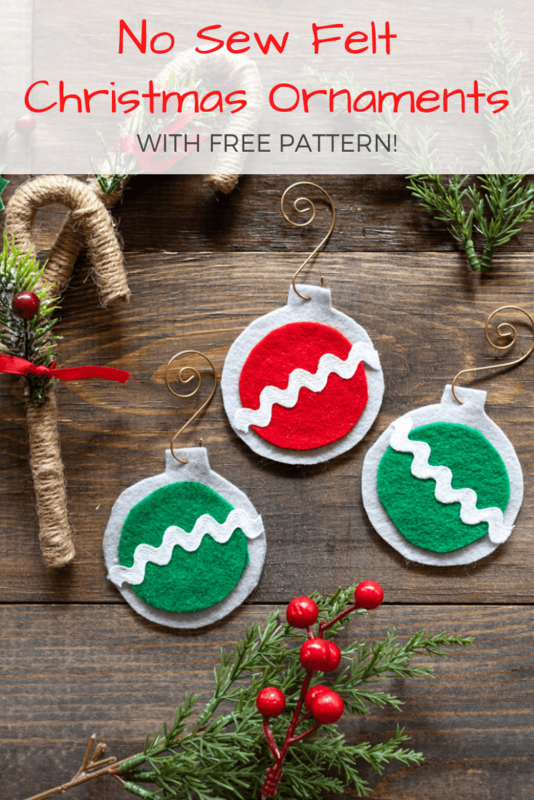 Your free printable Christmas ornament pattern! Something to trace your pattern with. A disappearing fabric maker is ideal. Honestly, I couldn’t find mine so I used a fine tip Sharpie. Depending on your felt, sometimes a regular pen or even a pencil will work. I just traced with a Sharpie, cut right along the line, and then turned the drawn-on side to the back to hide any stray marks. Felt. I used a light grey for the background, green, and red. Pick whatever colors you’d like! 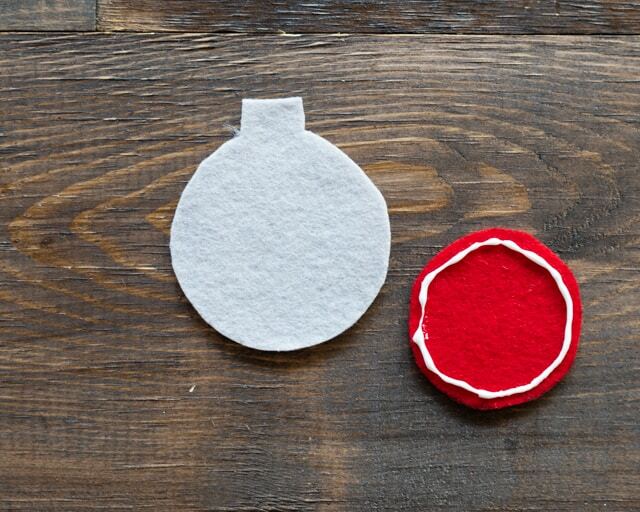 For super inexpensive ornaments, use up acrylic felt. 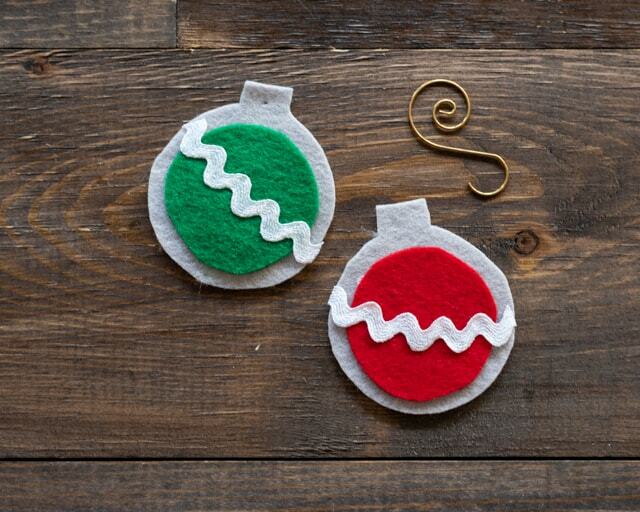 If you want your ornaments to be a bit “nicer,” look for a wool blend felt. Glue. 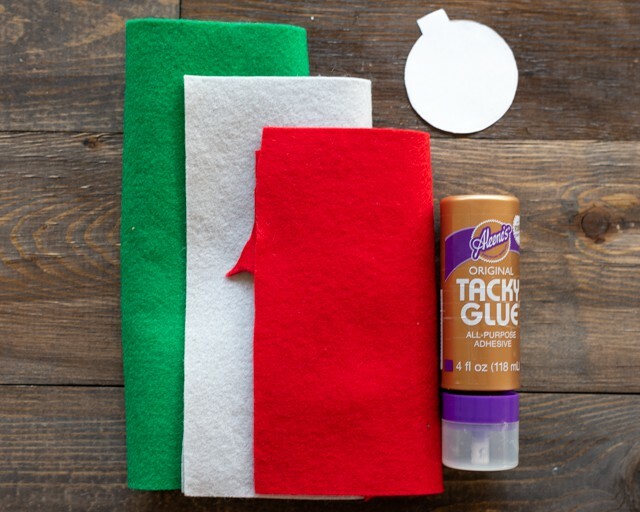 There’s no need to use fabric glue – Aileen’s Original Tacky Glue works wonderfully since you won’t be washing your ornaments. Decorative trim, ricrac, etc. Optional but highly recommended! Something sharp like a small awl, large needle, or even the tip of a sharp pair of scissors. Print your ornament pattern and cut out the pieces. You only have to cut one of each shape, but there are two on the pattern page so you have a spare set for little helping hands. Trace the larger background piece onto your background felt. Make as many as you’d like! Trace one smaller piece for each ornament from a “front” color. Cut out all of your felt pieces. 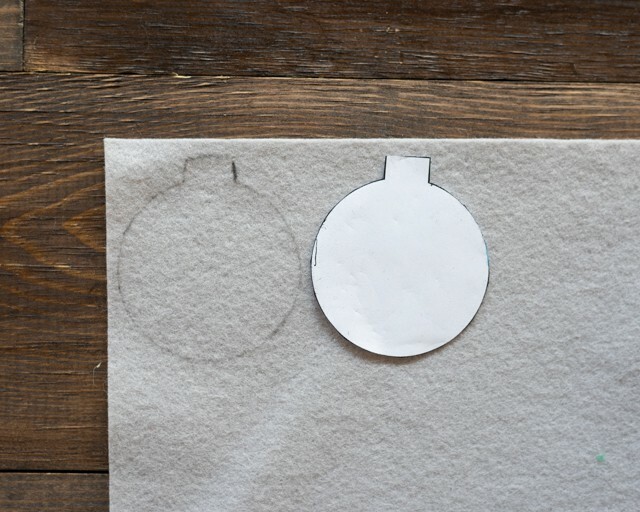 To assemble your no sew ornaments, lay a bead of glue around one inner ornament piece. Place it near the edge, but not exactly up on it so there’s less chance of glue squishing out. If there are visible pen or marker lines, make sure you glue on the marked side so it will be hidden. After my ornaments had dried for about an hour, I added ricrac. I cut and glued it one piece at a time to make sure each piece of trim was a good fit for the individual ornament. You can press the ornaments again, if you’d like. I recommend dabbing the ornament with a paper towel or scrap of felt to remove any excess glue before pressing again. I got a lot more leakage from the trim application than when I glued the ornaments together! After the glue has set for another hour or two, you’re ready to add hangers! Carefully use something sharp, like an awl or large needle, to poke a hole at the top of each ornament. Add an ornament hanger and you’re done! 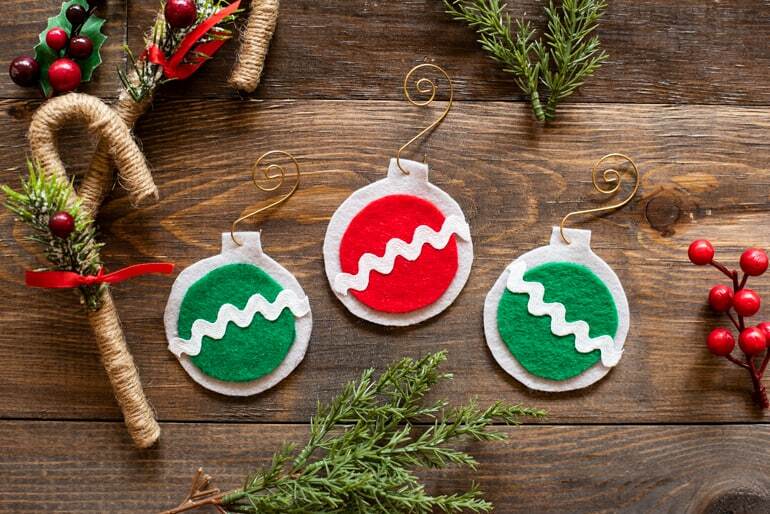 These ornaments are so cute, simple, and easy to customize! You out the metal hanger for a loop of yarn or twine to make them super kid-friendly, too. There’s nothing to break or poke little hands! Since our girl is a very active toddler, I have a feeling that unbreakable ornaments will be very important for us this year! 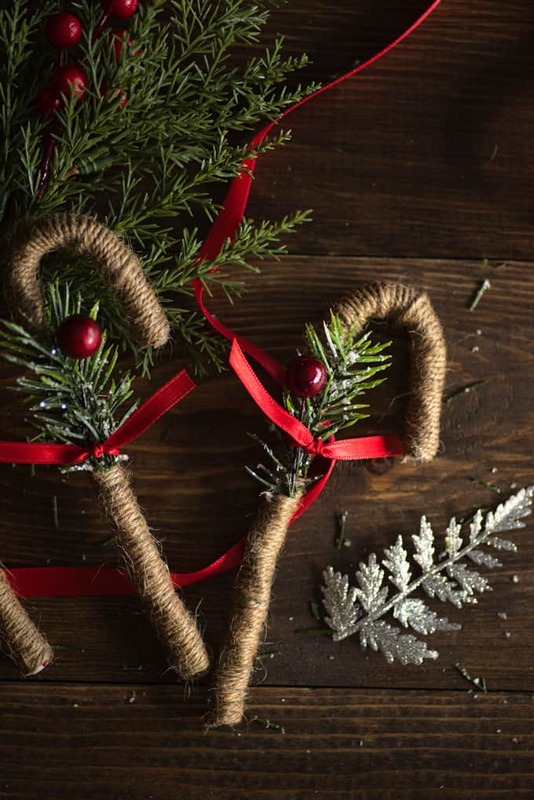 If you like the looks of the twine wrapped candy canes in the background, you can learn how to make your own cute rustic candy canes right here! They’re not quite as kid safe, but at least no one will be eating the decorations off the tree! 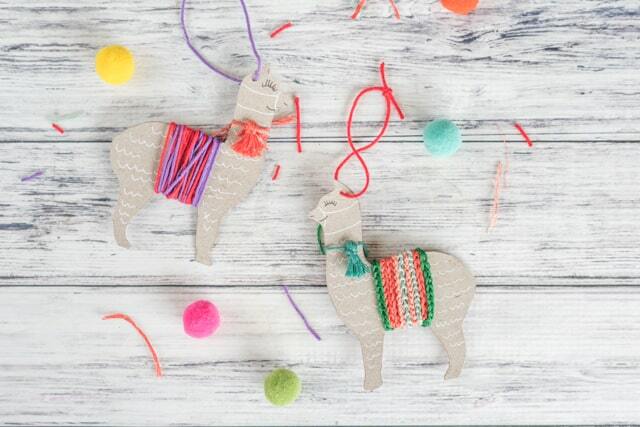 If you’re looking for ornaments that are a bit more modern, and also totally kid-friendly, check out these upcycled llama ornaments! 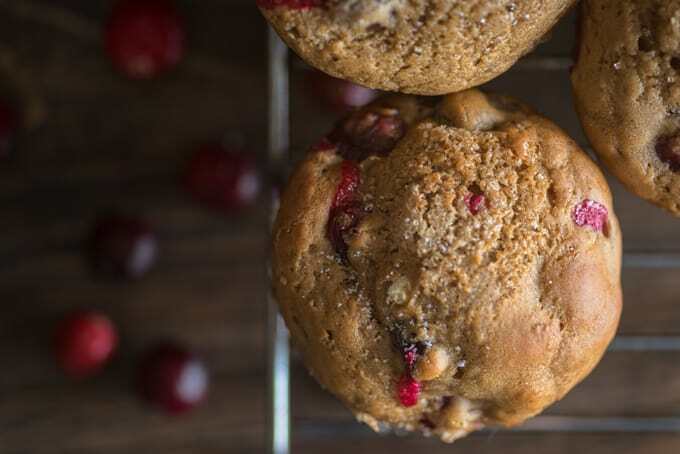 These sparkling cranberry muffins are another holiday favorite here on The Artisan Life. They’re made with Greek yogurt, so they’re a delicious, healthier for you choice. Yum! Do you have any tips on keeping toddlers safe during the holiday season? Out LG is running all over the place and I really don’t know how to keep her out of decorations and presents! Help! This post is linked at The Pin Junkie’s Thursday Pin Party! Very cute. No sew is up my alley! I love the rustic candy canes as a gift wrapping accent. Yes, they’d look very nice on presents! Last year I wrapped everything in brown paper with large burlap + cloth ribbons and bows. It was fun! They’d probably look nice with some of that ribbon for a cute, rustic look.